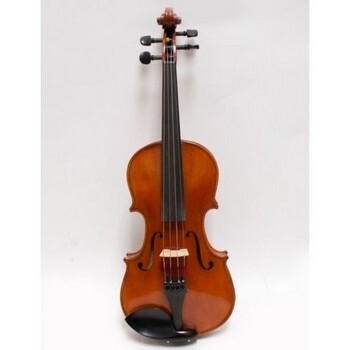 This used Stradivarius model has hand rubbed shaded brown varnish with golden highlights. Solid carved and meticulously graduated select, aged European spruce top and well-flamed, seasoned European maple back with matching ribs. Choice ebony trim throughout, including ebony pegs and tailpiece with gold diamond inlay. Thomastik Dominant strings. This violin has had one owner, and when put on consignment, our instrument repair department put on new strings and made a new bridge for the violin.